We at Presentation Graphics have years of experience in creative design and communication, producing a wide range of conceptual work as highlighted in our Portfolio. You will find creativity that is driven by the clients brief, rather than by fashion or fleeting trends. Our projects include a variety of creative printed material; from Corporate Identity/branding, Brochures, Posters, Flyers, Newsletters, Exhibition Stands to Corporate Presentations thru to website design using the latest software available. The value we add is to re-create your communications in a new and different light – one which makes your audience more interested in, and receptive to your message. Producing exceptional design work for our clients is not just about creating something that looks stunning. It’s about really understanding what will catch the attention of your target audience. It’s this philosophy, coupled with a wealth of creative experience, that’s resulted in us achieving great successes for our clients. From sophisticated marketing materials that build a brand to eye-catching advertisements that have true impact. Creating eye catching and innovative design that’s totally focused on getting a job done is what we’re all about. Are you ready? Give us a call now and let’s get to work. 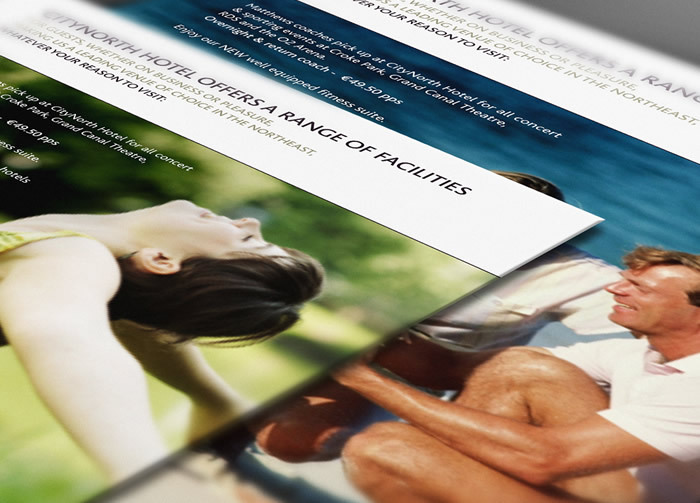 Leaflets & flyers as pieces of publicity are still a vital element of promotion. Nicely combined with your digital marketing presence through unique QR codes………….and if carefully crafted – are no longer destined to go straight in the bin. With the print costs of leaflets and flyers being so competitive, it makes perfect sense to use them in harmony with your digital marketing. Keeping the message clear, concise and easy to read is essential – There is no need to mix messages, fill every available millimetre and confuse the reader. Short sharp statements, eye-catching imagery, a strong headline and a great offer all have the power to make the customer act. A number of projects we undertake may include confidential information, Working with NDA's (Non-Disclosure Agreements) or similar agreements or documents is perfectly acceptable and we are happy to sign any such document before a project commences to reassure my client that their information will remain secure.